Empress Suiko, the first female to be ruler, requested that her nephew, Prince Shotoku, be her regent, or person who rules in place of an absent or underage monarch. His real name is actually Prince Umayado, which literally means ‘prince of the stable door,’ due to the fact that he was born on the doorstep of a stable, in 574. He lived until 622. Prince Shotoku, being extremely interested in Chinese culture, sent several Japanese scholars and artists to the great country, to learn their culture. He also gladly accepted skilled workers from China. To strengthen the link between Japan and China, Prince Shotoku made an embassy, or an office of a government in another country, in Japan. However, it is said that even though Prince Shotoku had interest in China, China was the one who initiated the contact. One of Prince Shotoku’s famous achievements was the creation of the Seventeen Article Constitution, which was mainly focused on Confucianism values, like hard work, and obedience to your superior. Even when the Constitution of Japan was taken into action on November 29, 1890, the Seventeen Article was still considered partially valid, due to the fact that it was never clearly casted aside. The current of Japan has only rejected some laws within the Seventeen Article Constitution, which contradicts some laws in the Constitution of Japan. Confucian values in China have five different relationships: father to son, husband and wife, elder and younger siblings, ruler to subject, and friend to friend. However, the Japanese changed Confucianism so that the entire system was inferior to the lord. 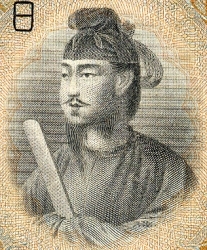 Prince Shotoku, in addition to the Seventeen Article Constitution, created the twelve official ranks at court, in 603. It is also called a ‘cap’ system, due to the fact that the officials for each different office all wore caps that differed in colors in designs. This was a sign of what office an official worked for, and was the first step toward different sections in government. Because of this system, people with not much status could become an official of higher rank that was based on loyalty to their country, and talent. However, the royal family kept their high rank, no matter what. Prince Shotoku also gave Japan its calendar system, derived from China’s lunar calendar. A Korean priest, by the name of Kanroku, taught this to the Japanese. 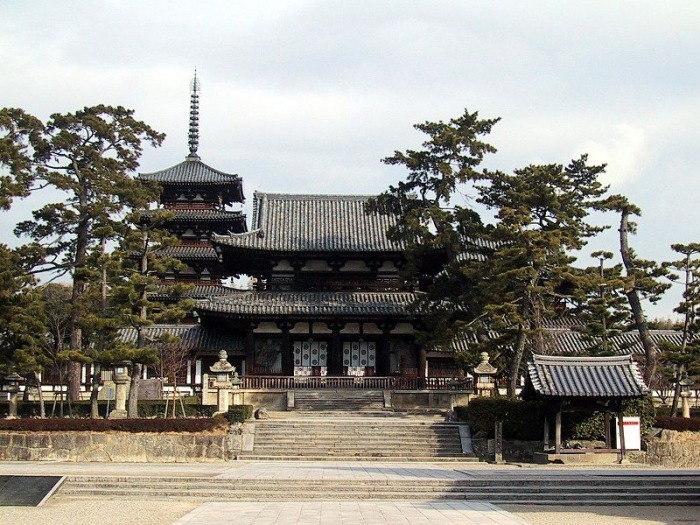 Prince Shotoku also built two temples, of which both were some of the first Buddhist temples in Japan, not to mention some of the most gorgeous. The Shitenno-ji was built in 530 A.D, and actually was the first Buddhist temple built in Japan. It worshipped the Four Heavenly Kings, each who watches over either North, East, West, or South. The Shitenno-ji has four different sections, each for a specific ‘king.’ They were to help the Japanese reach higher levels of civilization and humanity. 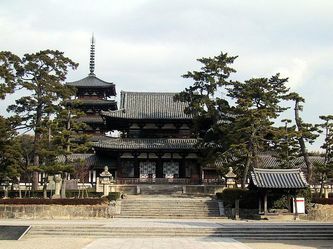 The other temple Prince Shotoku built was called the Horyu-ji. It has many unique and beautiful objects related to Buddhism, unlike the Angkor Wat, in the Khmer Empire, which worshiped Vishnu, a Hindu god. 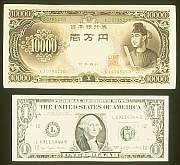 Prince Shotoku greatly contributed to Japanese society. He built two important temples, both of which were very grand, created the Seventeen Article Constitution, established the official ranks in court, and brought wonderful ideas from China to Japan.